Jennifer's Blog » Blog Archive » It’s a pirates life for me! 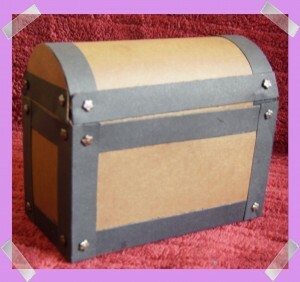 I was inspired to create this box from the Yaz box when I saw that someone was looking for a pirate/treasure chest. I created the rounded lid by lengthening the original lid from the Yaz box and then added tabs to secure the side panel. Then I created the side panel from a semi-circle and added a lip in order to prevent the lid from sinking down into the box. Some modest detail was added with 1/2 inch strips of black paper to the top and bottom borders, 1 inch strips of black paper folded in half and applied to the edges, and brads applied to the corners to appear as nail-heads. I probably could have added greater detail (hinges on the back, lock on the front), but I was not feeling creative enough to try. 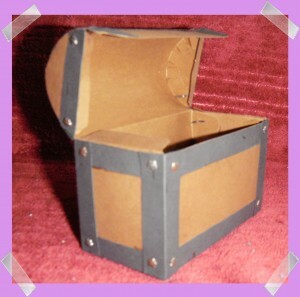 This entry was posted on Thursday, March 4th, 2010 at 4:00 PM	and is filed under Scrapbooking and Crafts. You can follow any responses to this entry through the RSS 2.0 feed. You can leave a response, or trackback from your own site.